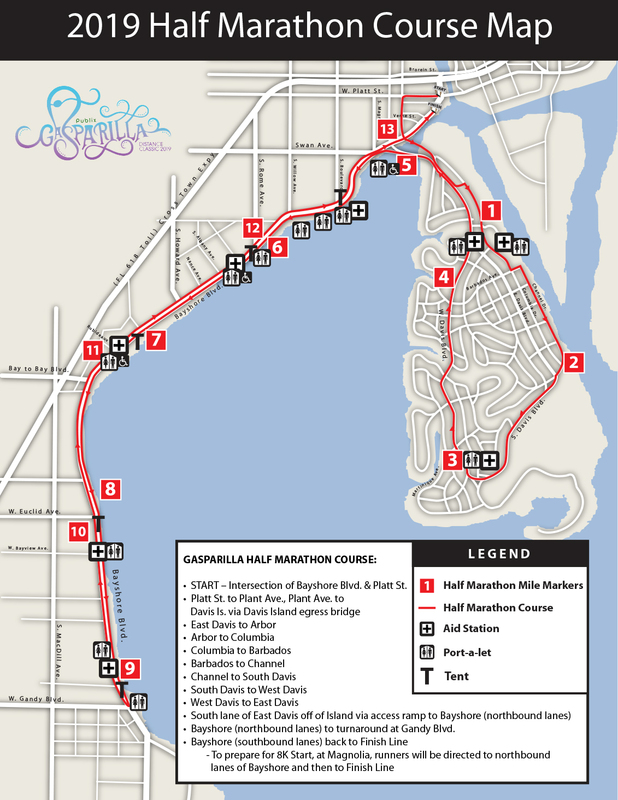 Publix Gasparilla Distance Classic 15K Capped At 6,500! 2020 Registration Opening May 1, 2019! Wheelchair participants and seeded athletes ONLY can access the 15K Start from the front by utilizing the Wheelchair/Elite Entrance located adjacent to the Start Platform. All other Participants must enter the start from the rear, utilizing the barricade breaks on either side of Brorein Street. 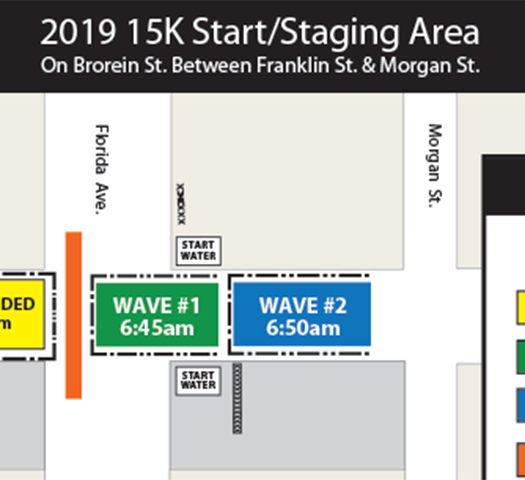 SEEDED MEN & WOMEN ONLY WILL ACCESS THE 15K START FROM THE FRONT AND SHOULD UTILIZE THE SEEDED/ELITE ENTRANCE LOCATED AT BROREIN STREET & FRANKLIN STREET. 15K Seeded Start Access: is limited and will be provided on a first-come, first-served basis. For access to the 15K Seeded Start Area, a written results verification is required and must be presented BY-MAIL with a completed entry form and payment. • All Open 15K registered participants will stage on Brorein Street behind the 15K Seeded Start Area. • 15K registered participants should enter from the barricade breaks on both sides of Brorein. • The barricade breaks will be according to Projected Finish Times; Projected Finish Time signage will be posted. • PLEASE, for the safety and enjoyment of all, line up according to your Projected Finish Time. Walkers are welcome in the 15K. Because of road closure permits, a 16-minute per mile pace must be maintained. 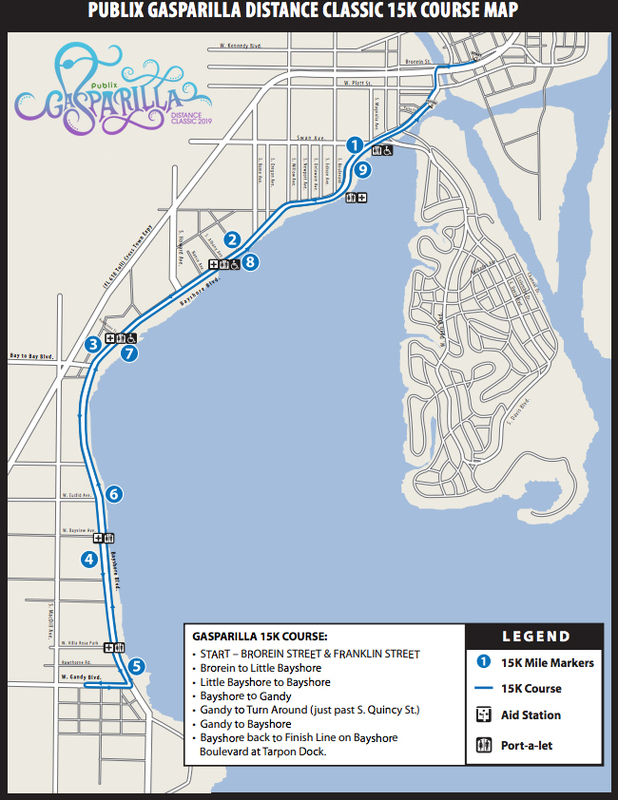 Those not able to complete 7-miles and reach Howard Avenue by 9:00 a.m. (2:15), will be moved to the Bayshore Boulevard sidewalk until Rome Avenue, at which time, they will be allowed back onto Bayshore Boulevard for the remainder of their 15K. These participants will be sharing the road with the Publix Gasparilla Distance Classic 5K participants. Refunds and/or transfers of registration are not allowed ANY of the 2019 Publix Gasparilla Distance Classic Race Weekend Events. Participants that register online and provide a correct email address will receive a Race Week Registration Confirmation via email no later than Monday, February 18, 2019. This confirmation will be in addition to the confirmation received from Active Networks upon completion of online registration. The Race Week Registration Confirmation will include each participant’s Race Number, Name, Address, Race Entered and Age. PLEASE NOTE: If at any time, you have unsubscribed from the Publix Gasparilla Distance Classic E-Blast Database, you WILL NOT receive a Registration Confirmation via email. You MUST rejoin the Publix Gasparilla Distance Classic E-Blast Database. To rejoin, Click Here. Registered participants who provide a correct and legible email address will receive a Registration Confirmation via email no later than Monday, February 18, 2019. Confirmation will include each participant’s assigned Race Number, Name, Address, Race Entered and Age. PLEASE NOTE: Registrations by mail must be postmarked by January 11, 2019. All 2019 Publix Gasparilla Distance Classic 15K participants MUST sign the Race Application Waiver. A Parent or Legal Guardian MUST sign the Race Application Waiver for participants under the age of 18. All Mail-in 2019 Publix Gasparilla Distance Classic 15K Race Applications must be postmarked by January 11, 2019. LATE ONLINE REGISTRATION FEES WILL BEGIN ON SATURDAY, JANUARY 12, 2019. Publix Gasparilla Distance Classic 15K participants will receive an Official 2019 Publix Gasparilla Distance Classic 15K Gender Specific Performance Wicking Race Shirt**, a Virtual Race Bag, a 2019 PGDC branded Publix Reusable Shopping Bag and for those that cross the Finish Line, a 2019 Publix Gasparilla Distance Classic 15K Finisher’s Medal, Post-Race food and beverages, a complimentary 12-ounce Michelob Ultra (21-yrs & Over) and a personalized Virtual Finisher’s Certificate (a valid email address MUST be provided with registration). **Publix Gasparilla Distance Classic 15K participants that register online after January 20, 2019, or wait to register during Race Weekend Late Registration (if available) will receive a Race Shirt, but will not be guaranteed a gender-specific performance wicking shirt and/or the correct sized shirt. Complete (but not Official) 2019 Publix Gasparilla Distance Classic 15K, 5K, Half Marathon & 8K Results will be featured in a Special Race Results Section in the Tampa Bay Times on Monday, February 25, 2019. In addition to the Tampa Bay Times PGDC Race Results Special Section that’s included in the Monday, February 25th Edition of the newspaper, for those folks that live out of the Tampa Bay Area or aren’t Tampa Bay Times subscribers, the TBT-PGDC Race Results Special Section will be available (and mailed to your home) for $5. This special purchase includes postage, packaging, handling, the Monday, February 25th Edition of the Tampa Bay Times and the 2019 TBT-PGDC Race Results Special Section that will offer Race Weekend Coverage, Race Photos AND complete (but not official) PGDC 15K, 5K, Half Marathon & 8K Age Group Results. Pre & Post-Race Massage! The Performance Massage Sports Massage Team will be providing Post-Race Massage following both the Publix Gasparilla Distance Classic 15K & 5K and Publix Gasparilla Half Marathon & 8K. The Team will also offer Pre- Race Massage during the 8 On Your Side Health & Fitness Expo on both Fri. and Sat. during Expo Hours. For more information or to book an additional Pre-Race and/or Post-Race Massage, please contact Glen Kemp, 813- 831-7007. 2019 Publix Gasparilla Distance Classic 15K Race Packet, T-shirt and Race Number Pick-Up will take place during the 8 On Your Side Health & Fitness Expo being held at the Tampa Convention Center – East Hall on Friday, February 22, 10 a.m. – 8 p.m., and on Saturday, February 23, beginning at 6:00 a.m. PLEASE NOTE: If you are not able to attend the Expo and pick-up your Race Number, a Race Number Pick-Up Authorization Form must be completed, signed and presented by whoever WILL be picking up for you. A downloadable version of the Authorization Form can be found below. The Gasparilla Distance Classic Association is once again proud to lead the pack in offering to its runners and walkers the latest in timing technology. In 2019, race participants will be timed utilizing the ChronoTrack B-Tag Timing System, developed and designed with RFID – radio frequency identification. Here’s how it works. The technology is woven into a tag that will be placed on the back of each runner’s bib/race number. Transponder pads at the Start Line, Mid-Way Point, and Finish Line will record the participant’s time in preparation for the Tampa Bay Times Race Weekend Results. Post-Race, each participant will receive both their Start Time (Gun Time) and Net Time (Timing starts when runner/walker actually crosses the 15K Start Line and ends upon crossing the 15K Finish Line). At the Finish Line, there will be no back-ups…runners and walkers will cross the Finish Line…revel in what they’ve just accomplished…be given their Finisher’s Medal, stop to pose for pirate-y photos at the MarathonFoto Booth and then head to Cotanchobee Park for the Q105 Post-Race Celebration! PLEASE NOTE – If you intend to run the 15K AND 5K on Saturday, February 23, 2019, you must register and complete an Entry Form for both events. Unless you are running the Michelob Ultra Challenge, Michelob Amber Challenge or Michelob Ultra Pure Gold Challenge, you will be issued a 15K Race Number AND a 5K Race Number. When running the 15K, you MUST wear your assigned 15K Race Number ONLY. Do not wear or carry your 5K Race Number. Before starting the 5K, you MUST remove your 15K Race Number and replace with your 5K Race Number. Because of the sensitivity of the Chrono Track Timing Device, wearing or carrying your 5K Race Number during the 15K OR wearing or carrying your 15K Race Number during the 5K could impact your Tampa Bay Times Race Weekend Results.